Description: Country living in the city! Amazing 1+ acre lot w/30x25ft detatched garage. So much new:driveway, sidewalk, hardy board siding, roof, deck, paint & more! 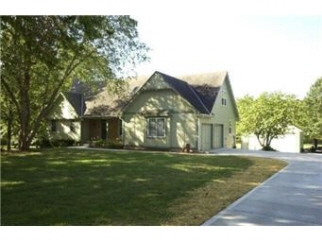 Huge master suite w/fireplace, garden tub, custom closet & door to deck w/hot tub. Super sized secondary bedrooms. Finished walk-out bsmt w/4th bedrm, full bath rec rm & wet bar.This home is a 10! Directions: From 69HWY & 151st ST. 151st ST E to Metcalf. S on Metcalf to 163rd TR. E on 163rd TR to Riggs. S to home.